ONLYOFFICE Document Server offers text, spreadsheet and presentation editors compatible with MS Office and OpenDocument file formats, among others. It works within a browser and allows you to create and co-edit documents choosing one of the co-editing modes: Fast (shows the changes made by co-editors in real-time) or Strict (hides other user changes until you save your own changes and accept the changes made by others). Commenting, tracking changes and built-in chat are also available. 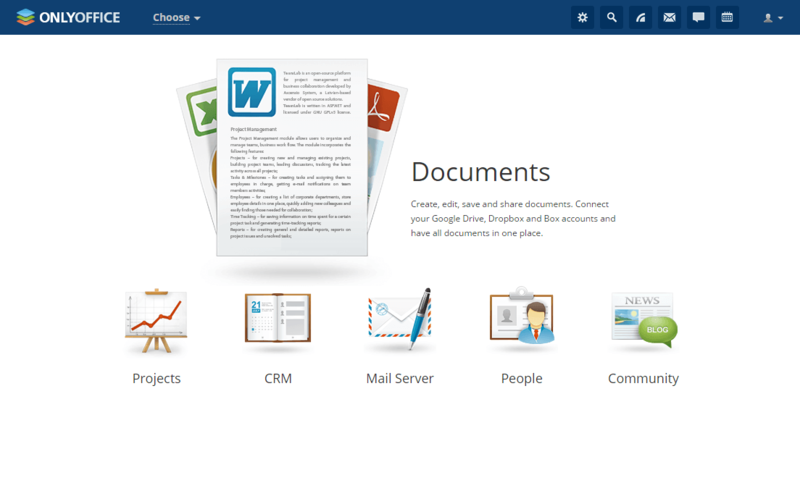 ONLYOFFICE Community Server comes with mail client, document management tools, projects, CRM, calendar, and community with blogs, forums, and wiki. ONLYOFFICE Mail Server, developed on the base of the iRedMail, is used to create and manage mailboxes using your own domain name. get invitations from other calendars and accept or reject them. You can deploy the latest stable version of ONLYOFFICE using the official Docker script. It allows you to install the whole system on a single machine avoiding the dependency errors. In general, each ONLYOFFICE component requires some dependencies to be installed on your Linux machine. With Docker, only one dependency is needed – Docker v.1.10 or later. Important: Please note that the size requirement for a server to run ONLYOFFICE depends on the components you need and how much documents and mails you plan to store. 6 GB of RAM is necessary for the efficient work of the whole system: Document Server, Mail Server and Community Server. To install it without mail server, 2 GB of RAM will be enough, given the necessary amount of swap is available. Let’s proceed further to install ONLYOFFICE in Linux distributions. Step 1. Download ONLYOFFICE Docker script file. Step 2. Run the complete ONLYOFFICE installation. Important: Please note that to perform this action you must be logged in with root rights. # bash opensource-install.sh -md "yourdomain.com"
Where yourdomain.com is your own domain used for Mail Server. Step 4. 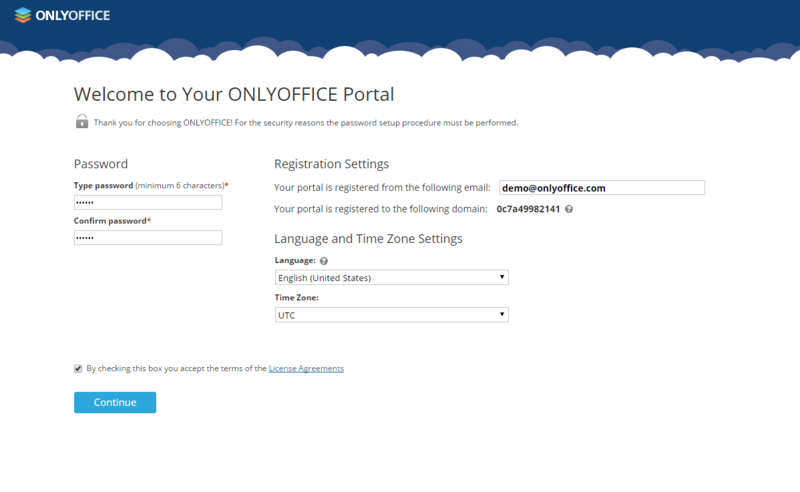 Configure your web office by adding your email, password and its confirmation to use them next time to access ONLYOFFICE. Select the language and time zone (you will be able to change it later in Settings section. Click Continue. Step 5. Invite your team member by going to the People module using the corresponding icon. 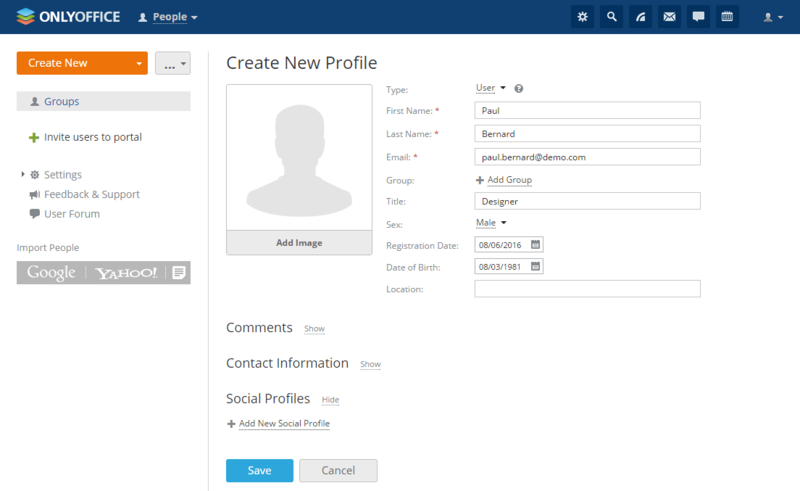 Click the Create New button in the left upper corner, select the User option from the drop-down list. Fill in the required fields and click the Save button. The invitation message will be sent to your team member. Following the link provided in this email, he/she will be able to join your web office. ONLYOFFICE is a feature-rich productivity suite that helps to organize every step of your teamwork without switching between different applications. The Docker script made it easy to deploy and run your web office on any Linux machine allowing to avoid common dependency errors and installation issues. May I get similar kind of stepwise process on how to do setup of onlyoffice server on windows 10 machine? Been able to install & use it for the 1st time but when I try to restart my machine, the service doesn’t start automatically, please provide guide on how to make ONLYOFFICE services starts permanently. And where is the config / files located, looking forward to your kind response. Many thanks & more power! Did you install ONLYOFFICE following these instructions? If so, please check if Docker restarts after you restart your machine using the Docker ps command. May I know where you getting such not found package error? But i have one question is it freeware? Yes, its open source and free upto 20 users..